That being said, investing in stocks is a long time strategy. 3 years hardly shows any long term alpha effects. My plan is to continue buying large, successful business that pay out dividends and grow their profits over time. 🙂 As usual to see what specific stocks I have in my accounts you can look through the portfolio menu on the top of the site, the stocks category to the right, or search this blog for particular company names. Research shows that men are 1.5 times more likely to develop parkinson’s disease than women. I’m not sure about your first point. You did say you have non canadian equity in your holding, so a canadian only index is not a “fair” benchmark. If you want to calculate the impact of your stocks picking, you need to use a similar mix. If you have 80% canadian stocks and 20% US then try using a mix of 80% VCN and 20% VUN as a benchmark. Agreed. The two benchmarks used are completely useless; most comparisons are useless. What you should be using is your own required (and/or desired) return benchmark needed to accomplish your financial goal. I know using TSX/S&P makes it familiar and easy for people to relate, but it’s wrong and propagates the misguided mindset. As well, the 6-11% range of future returns is very high. A lot of smart people have stated average annual stock returns will settle within a much lower bound, 3-6%, for the next couple of decades. Other than that, nice work! ? Picking a personalized annual return to meet my goals sounds like a better way to gauge my progress towards retirement. I just need to find a balance between what I want and what’s realistic lol. 🙂 In a slower global economy it’s understandable that stock returns may be lower in the foreseeable future. When I saw 1.08 usd vs 1 euro, I immediately take money out of my s&p 500, and put into European mutual fund. It has since declined a little bit. However, I feel in the long term, as the euro strengthen against the US dollars, regardless how much the market make, I would stand to make a big profit. My brokage doesn’t allow me to buy individual foreign stocks. However, when I realized Canadian banks are listed in the us stock exchange, I launched my mini Canadian bank etf. (Canadian dollars was 1.15 vs 1 usd at some point) when the Canadian dollar recover, this should be sweet! As the Canadian entering the recession, I don’t know how this will play out, it could be a long wait. In the meanwhile, I guess the Canadian banks are issuing 4-6% dividend yields, which is way better than putting my money in a saving account. Would you ever consider forex trading? My friend did forex for awhile, and she was living like a queen. Then, her and her partner broke up, that ended the party. Not sure why you think high liquidity means you could win in possibly the most manipulated asset type in the world. Might as well go to the race track and have some fun losing your money! You have to remember that “the market” simply records the aggregate return of all participants/trades. Most participants (amateur and professional alike) do not beat “the market”; this means that the very small percentage of winners are winning by a lot in order to raise the aggregate to its final level. In other words, what you want and what’s realistic can be the same thing. To do so, however, you might have to do a lot more work than just buying a lazy index fund. True. For every Ben Graham there are many who underperform. Interesting chart. 🙂 It’s kind of sad how poorly most investors do though. I don’t have any proof I can beat the benchmarks since my average portfolio return has a combination of US and Canadian stocks so it’s kind of a mixed back lol. Maybe later this week I’ll post a comparison of just my Canadian stocks and line it up with the TSX Composite for a more fair comparison. 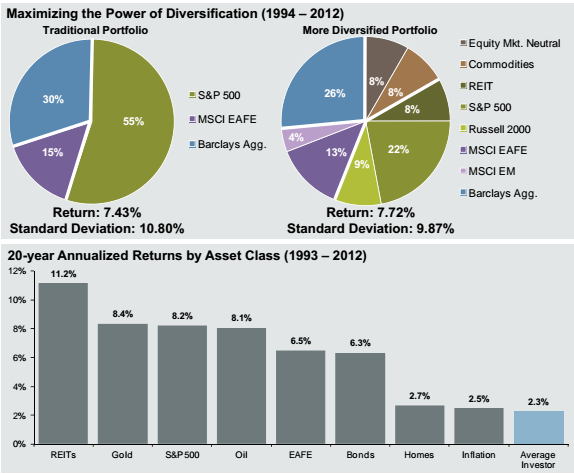 Respectfully, a 3-yr return isn’t proof that you’re able to outperform the markets over time. If someone had Valeant in their portfolio this year, they are almost guaranteed to outperform the TSX. That doesn’t mean that they are able to replicate their outperform each year though. There are towers full of people who work from morning to night trying to outperform the TSX & S&P. Again, with all due respect, I don’t think this is the best use of your time. From your blog, you have evidenced an ability to add value through other financial assets. And you’re able to utilize leverage for those investments, which is something you favor. Unless you happen to be the CDN Bill Miller, it’s extremely likely that you’ll underperform the TSX over a 20-30 yr period. Since your focus is on dividends, maybe you look at purchasing a dividend ETF that would provide greater return for the risk you’re willing to take.